Priests of Moscow Patriarchate in Ukraine face a choice: join Ukraine’s new independent church and be labeled a renegade by supporters of his own church, or stay away, and risk being branded a Russian agent. It is a decision facing thousands of clerics as Ukraine prepares to sever ties to the Russian Orthodox Church going back to 1686. For the Ukrainian authorities it is an essential step to tackling Russia’s malign influence on its soil, four years after Russia annexed Crimea and backed separatists in a conflict that has killed more than 11,000 people. It may also help President Petro Poroshenko, who championed the split, shore up support in a tight election race next year. But the move is opposed by the Kremlin and the Russian Orthodox Church, which compared it to the Great Schism of 1054 that split western and eastern Christianity. 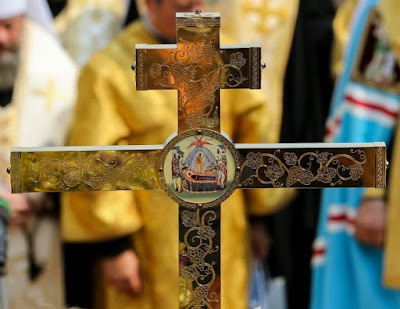 Metropolitan Oleksandr, a member of the traditionally dominant Ukrainian Orthodox Church (Moscow Patriarchate), wants to join the new church because of what he calls its poisonous association with the Russian state. “We love Russians, we love Russia, but we don’t love those who have unleashed a war on the part of Russia and who are feeding it today,” he said in an interview. He echoes critics who call his church a tool used by Moscow to justify Russian expansionism and their support for the militants. Oleksandr compares setting up the new church to removing a diseased body part by surgery. “The surgical method is painful, but it must be done in the end in order for the body to begin to recover,” the 41-year-old said. At the same time, the Moscow Patriarchate has labeled those wanting to join the new church as “schismatics”. A high-ranking official, Metropolitan Antoniy, said joining the new church would be a betrayal. In May, the Moscow Patriarchate censured Oleksandr for “obscene” behavior and told him to stop making public statements that could lead his followers into temptation. Ukraine in October secured approval to set up an independent church from the Ecumenical Patriarch in Istanbul, the global spiritual leader of Orthodox Christians. The next step is for Ukraine’s various church strands to meet to decide the make-up of the church and who will lead it. The Russian Orthodox Church retaliated by breaking off all ties with Istanbul and accused the United States of engineering the split behind the scenes. President Vladimir Putin on Wednesday warned of “painful consequences”. Patriarch Kirill of Moscow called the Ecumenical Patriarch Bartholomew’s support for an independent Ukrainian church “shameless”. He said Orthodox unity could be preserved only through the “resistance of our people, our clergy, our episcopate, to every mean trick, to every heresy, to every schism”. Support for the Kyiv Patriarchate swelled after the annexation of Crimea. It supports church independence and Ukraine’s closer integration with the West. Oleksandr estimates between 40-70% of Moscow Patriarchate churches will join the new church, though his parishioners have mixed views. Some support it, while others, like Anna Trofimova, oppose it as a “political game”. Archbishop Kliment, spokesman for the Ukrainian Orthodox Church (Moscow Patriarchate), said in an interview that his church was the victim of a smear campaign. As an example, he cited Foreign Minister Pavlo Klimkin’s statement that his church had no place in Ukraine and suggested it root out Russian agents in its ranks.